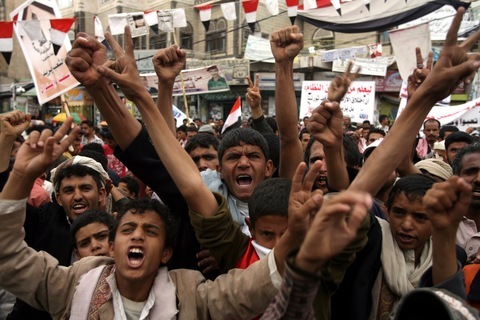 Yemeni anti-government protesters demonstrate against President Ali Abdullah Saleh. Photo by Mohammed Huwais/AFP/Getty Images. Officials said 57 of 62 inmates held at a prison in Hadarmout province in southern Yemen escaped after gunmen created a diversion, allowing the inmates to escape through an underground tunnel. At least one guard was believed to have been killed in the attack. The escape comes amid fears that the country’s growing unrest and widespread protests against President Ali Abdullah Saleh, who is in Saudi Arabia after being injured in an attack on his compound, could destabilize the country and embolden extremists operating from within Yemen. The United States has been providing Yemen with training and money to address elements of al-Qaida within the country. They have been named in both the plot to attack a passenger plane near Detroit and in planting bombs in cargo planes bound for the United States. Among the inmates who escaped were those who had already been convicted on charges of terrorism. A military court in Bahrain sentenced eight Shiite activists to life in prison on charges of trying to overthrow the country’s monarchy and communicating with “a terrorist organization abroad.” Thirteen others were given prison sentences. Shiites make up the majority of Bahrain’s population but have claimed pervasive discrimination by the country’s Sunni monarchy. Bahrain’s government claimed that the protesters were backed by Iran, which is also majority Shiite, a charge that activists have denied. 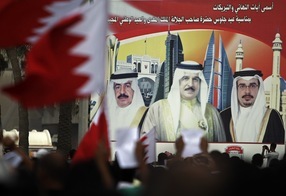 Bahraini Shiite anti-government demonstrators wave national flags as they march past a billboard bearing pictures of the al-Khalifa family. Photo by Joseph Eid/AFP/Getty Images. The same court convicted two men on charges of killing a police officer during protests. Thirty doctors and nurses are on trial on charges of supporting protesters. President Obama is expected to outline a plan to reduce troop numbers in Afghanistan by 10,000 over the next year, beginning with 5,000 this summer and an additional 5,000 next spring, according to a defense official cited by the Associated Press. The president will announce the plan in a televised address Wednesday night. President Obama reportedly made the decision on Tuesday, following consultations with senior military officials, including Gen. David Petraeus and outgoing Defense Secretary Robert Gates. The president’s announcement comes amid growing pressure from members of Congress who want to see a steeper withdrawal. In May, a bipartisan amendment in the U.S. House of Representatives to speed up the exit from Afghanistan did not pass by a mere six votes. Almost a decade into the war, economic concerns have also spurred some lawmakers to call for a more domestically focused policy, but some are concerned that a rapid drawdown could unravel gains made against the Taliban. President Obama’s full speech will be live-streamed on the NewsHour’s website, and you can see a preview from experts and analysis on the NewsHour’s two broadcasts Wednesday evening. China’s vice foreign minister, Cui Tiankai, said Wednesday that the United States should avoid getting involved in territorial disputes surrounding the South China Sea and allow China, Taiwan, Vietnam, Malaysia, the Philippines and Brunei — all of whom claim some part of it — to sort out the issue on their own. China and Vietnam have recently sparred over oil exploration and the location of vessels on the South China Sea. “I believe the individual countries are actually playing with fire, and I hope the fire will not be drawn to the United States,” Cui told reporters. Secretary of State Hillary Clinton has previously expressed concern over the maritime disputes, and officials in the Philippines have cited a 1951 treaty that could call for U.S. defense of its vessels, according to the Associated Press. Chinese and U.S. diplomats are expected to gather in Hawaii this weekend for meetings on a variety of issues.